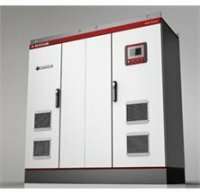 •Mature inverter control technology guarantees the product lifetime lasts for 25 years; The series is able to stably operate under severe grid condition, meeting higher electricity quality requirement;The unique design of islanding protection enables active protection with all kinds of load. •Self-contained reactive power compensation realizes solar generation during the daytime and reactive power compensation during the night according to grid situation.Humanized touch screen design provides outstanding human-machine communication.Low Voltage Right Through (LVRT) capability enables inverter remain connected and work properly during short grid fault. •Max Power Point Tracking (MPPT) efficiency as high as 99.9%;Total Harmonic Distortion of Current (THDi) at nominal power less than 1%, THDi remains less than 3% under 1/4 nominal power;Continuously adjustable power factor between 0.95 leading and 0.95 lagging maximize the grid compatibility.